At a price you want. Now stop imagining because it's here! 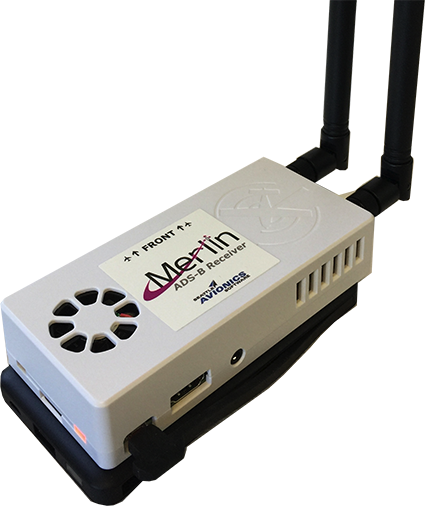 The new Merlin is the insanely affordable ADS-B receiver that doesn't skimp on features or look like a stick of chewing gum. Not only is it a dual-channel receiver, this little wonder also packs a WAAS GPS, a battery pack, and even an AHRS! Yes, an AHRS for true yaw, pitch, and roll when used with FlyQ EFB's 3D Synthentic Vision. The AHRS alone generally adds $200 or more to the cost of an ADS-B receiver. Simply connect the included battery pack (or power the Merlin with the included USB cable), connect your iPad to its wireless network, fire-up FlyQ EFB and get weather and traffic on your iPad! Fully assembled and individually tested / calibrated. Not a kit. Integrates with most popular iPad and Android apps including FlyQ EFB and ForeFlight*. Introduced more than a decade ago by the FAA, ADS-B (Automatic Dependent Surveillance-Broadcast) provides weather and traffic information to all aircraft equipped with an ADS-B receiver, such as the Merlin, subscription-free. The extremely portable Merlin receiver provides ADS-B weather and traffic to FlyQ EFB (sold separately) for display on an iPad. The Merlin also receives traffic information on the 978 (ground to air) frequency for local traffic coverage and 1090 (air to air) for the widest possible coverage area. FlyQ EFB displays this traffic using intuitive colors that signify threat levels, future-position lines so you can understand where the targets will be in 2 minutes, and an optional filtering system to remove targets that pose no threat so you can focus on ones that might. Many iPads do not include a GPS and, even those that do, include fairly limited GPS receivers. By contrast, the Merlin integrates a WAAS GPS -- the kind normally found in ADS-B receivers costing hundreds more. Now here's something you NEVER see in an ADS-B system that costs less than $800 -- a true AHRS! AHRS stands for Attitude and Heading Reference System. This provides true yaw, pitch, and roll to FlyQ EFB, making the 3D synthetic vision come alive! ADS-B traffic is broadcast from ground stations on 978 Mhz and from air-to-air on 1090 Mhz. The Merlin is a dual channel system that receives traffic from both channels, giving you a more complete traffic picture. The Merlin comes complete with a battery good for about 4 hours of use. Or use the included USB cable to connect to any USB power source, such as the USB power adapter you already have in your plane. It takes less than a minute to connect the Merlin to your iPad: Just connect the iPad to the Wi-Fi network that the Merlin creates and launch FlyQ EFB. Merlin works with most popular iPad and Android apps such as FlyQ EFB and ForeFlight. It does not work with Garmin apps or devices. The Merlin about width of an iPad mini and an inch thick. Approximate size: The unit itself is approximately 5.5" x 2.25" x 1". The battery pack adds another .8" in height. When connected, the antennas add 1.5" to the long side of the unit and extend about 7.25" from the joint. The antennas are connected via a standard coax connector so can be replaced by other antennas if desired. The unit's AHRS is calibrated for one specific orientation but it can be changed in software to allow for vertical or speciality mounting. The battery is 6000 mAh/22 2WH with an input of DC 5V 2A max, output of DC5V 2.4A max. *ForeFlight is a trademark of ForeFlight, LLC. Seattle Avionics and ForeFlight have no business agreement or relationship and ForeFlight has not endorsed or approved the Merlin ADS-B although functionality has been verified by 3rd parties.